Is Plato Riding the London Tube? I’ve lived in London for two years. Since the very first moment I arrived, I knew I would always love this city. In the enormity of London we can find everything we could have ever imagined, and more. We can meet amazing people we would never imagine that would exist and live the most interesting experiences, those that shake our brains and make our hearts vibrate. However, sometimes it was difficult to find my way in a huge city like London, where life is like a crowded race in which people seem to be looking forward to the next thing, too occupied, to even realise that you are next to them. The wildness and beauty of this city provoke contradictory feelings all the time. One can wake up happy because the sunlight is shining and the birds are singing and in less than one hour you can feel disgusted, tired and irritated because you have to commute nearly one hour in a packed train full of smelly people, moving around the darkness of the tube tunnels. But it’s precisely in those moments of frustration, that I realised that London still takes my breath away offering those curious happy instants that make everybody smile. I’m referring to the amazingly inspiring service information notes that are displayed all over the stations. Soon, I learned that reading the messages at the trains stations was a good way of getting useful information and learning new things, as well as keeping myself distracted. And I found some of these messages so inspiring and even stirring that I started collecting them. 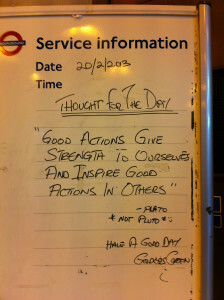 One worker of the tube, most of the times ignored by the hundreds of people passing around every day, had the idea of writing this Plato quote and sharing it with all the commuters! Don’t you think it’s a beautiful act of sharing positive attitude? And the fact that it was done in such a stressful and impersonal city like London made it even more special. 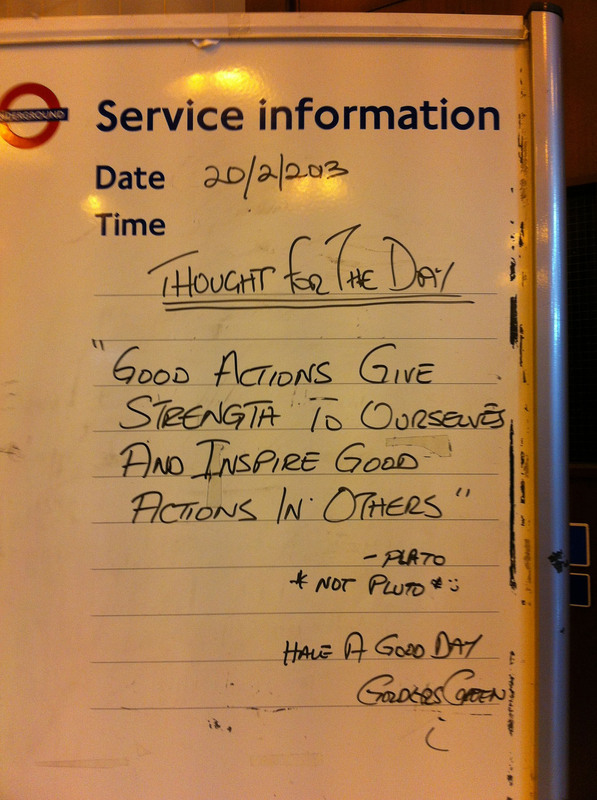 So, as Plato said and as the tube worker demonstrated… good actions give strength to us and inspire good actions in others.